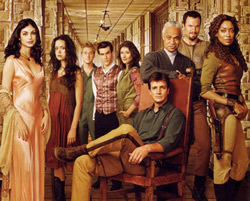 This popular Joss Whedon series effectively mixes the science-fiction and Western genres. In the year 2517, the renegade crew of the rag-tag, Firefly-class spaceship Serenity makes their living in a distant star system via unorthodox means. Captain Malcolm “Mal” Reynolds (Nathan Fillion) and his first mate Zoe Washburne (Gina Torres) are veteran “Browncoats” of the Unification War — a failed attempt to resist the evil Alliance’s control. They are joined by pilot and Zoe’s husband Hoban “Wash” Washburne (Alan Tudyk), former mercenary Jayne Cobb (Adam Baldwin), mechanic Kaywinnit Lee “Kaylee” Frye (Jewel Staite), religious Shepherd Derrial Book (Ron Glass), Companion Inara Serra (Morena Baccarin), and Dr. Simon Tam (Sean Maher) and his prodigy sister River (Summer Glau). TV Series Episodes: A Free Download from Amazon! I love the series and hope they continue producing it in the future. It was a shame it was cancelled. I really did love this show. I’d love to see it come back, but now Nathan Fillion has Castle and Gina Torres has Suits so I don’t know who else could play those roles. Maybe if Castle ends he could resume it, I doubt that he would have the time to do both but that would be great if he did. In the meantime, Gina Torres doesn’t have as much on screen time in Suits so maybe she could play both roles. What a great show, why must all of the really cool ones get cancelled? Cheers! Sienfeld! MASH! FIREFLY! All of them started with low ratings. The only difference between Firefly and the others is their networks gave them a chance to grow their audience. FOX didn’t. They could have had a major hit on their hands. Very sad. so very sad it got cancelled. The worst part that it didn’t done a hole season..
A great and truly original work of science fiction. Came ahead of its time. Ended before its time. Truly the best television show. Such depth and complexity. Such a sad thing the network couldn’t keep it. At least serenity will soar on through the years with the millions of fans supporting her. Gorram FOX!!! Best. Show. Ever. It’s been several years now since the crushing murder of this brilliant and underrated series and I still miss it . I wish the networks would get their stuff together and STOP trashing such amazing shows! Not every viewer is a brainless drone, and we need to have more intelligent programming that is also fun to watch! Get your act together exec’s! !